At Last! An act that goes beyond a Band. A show that goes beyond a concept! See and experience Fleetwood Mac the way they really were – a sensational and enduring band of the 70’s and 80’s – by a talented group of musicians dedicated to the task of bringing this era, this sound to the stage for all to enjoy. Before your eyes, see this concept take shape – the fabulous costumes of the 70’s, especially those worn by the two beautiful “Mac” ladies – Stevie and Christine. Hear the magical Fleetwood Mac sound, reproduced to the highest degree of authenticity, by this committed team of musicians who genuinely love what they are doing. This is total impersonation! This is something special! 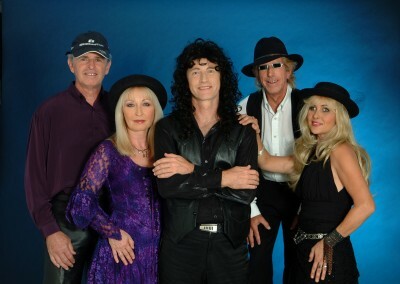 Formed on the Gold Coast of Queensland in 1995, the band consists of five musicians who have pooled their talents and energies to achieve a combination that is hard to equal. A tight, punchy rhythm section, guitar work which varies from sensitive to screaming, combined with piano and keyboards both rich and full. Add to this, the harmonies of four superb vocalists, and Fleetwood Mac, at it’s best, lives again. Introducing Simmone Fellows, the mysterious and charismatic Stevie Nicks – Fleetwood Mac’s breathtaking songbird. Also featuring Debbie Hinton as the alluring and brilliant keyboardist and vocalist Christine McVie. Graeme Thompson is at his best as the solid Bass Master – John McVie. He is the “Mac” of Fleetwood Mac. See Tony Cowell portray the Moody, artistic and sensitive Song & Guitar man – Lindsay Buckingham. And to compete the show, the powerful drum sound of Mick Fleetwood, the creator and Mentor of Fleetwood Mac, – superbly delivered by Terry Gascoigne. This is without doubt, one of the best musical concept shows to come out of Australia.